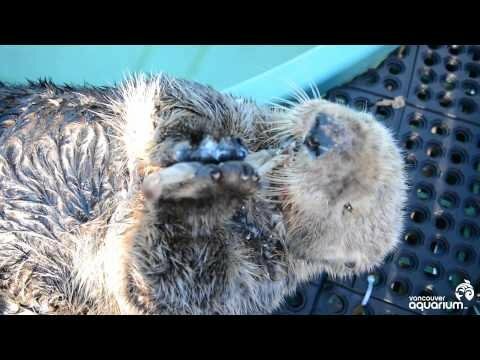 Last month, this sea otter was fighting for its life after someone shot it with a shotgun on the shore of Vancouver Island, British Columbia -- leaving him blinded and requiring one of its hind digits to be amputated. But after undergoing treatment in the hands of veterinary staff at the Vancouver Aquarium, the injured otter is now on the road to recovery, regaining his strength with a steady diet of clams and shrimp. Despite being unable to see, the rescued otter, named Walter, still makes short work of his meals using his incredibly tactile front paws. Because of his injuries, however, Walter will need assistance for the remainder of his life. Sea otters are listed as a 'threatened' and protected under the Canada Fisheries Act and Regulations, making shooting of this animal a Federal crime. Due to overhunting for their prized pelts, the species was driven to extinction in the province early last century. Walter descends from a group of otters that were reintroduced to the region in the 1960s, transferred from Alaska. Today, there are an estimated 4,700 sea otters in British Columbia -- a heartening sign of their perseverance, though as evidenced by Walter's story, familiar human threats persist as well.